This image shows the spectacular stellar outburst of V838 Monocerotis in 2002. Scientists now suspect the outburst was caused by a so-called "common-envelope event," an outburst from two stars sharing a gas shell. Image released Jan. 24, 2013. Scientists have detected what appears to be a stellar outburst from a pair of stars locked in a cosmic tryst within a shared veil of gas, a find that marks the first discovery of a long-sought type of space eruption. Most outbursts from stars are lumped into two categories — novas or supernovas. A nova is a thermonuclear explosion from a white dwarfstar driven by fuel piled on from a companion star. Novas do not result in the destruction of their stars, but supernovas do. Supernovas, which are bright enough to briefly outshine all the stars in their galaxies, happen in two known ways — type Ia supernovas occur after a white dwarf dies from gorging on too much fuel from a companion star, while type II supernovas take place after the core of a star runs out of fuel, collapses into an extraordinarily dense nugget in a fraction of a second, and then bounces and blasts outward. Now, researchers suggest the culprits behind these enigmas may lurk behind shrouds of gas. "I find it extremely exciting that we have explained a class of events that previously no one knew what they were," study lead author Natasha Ivanova, an astrophysicist at the University of Alberta in Canada, told SPACE.com. "That does not happen very often in science." 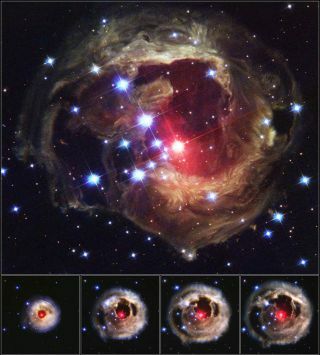 This image shows the amazing V838 Monocerotis outburst of 2002 in stages. Scientists think it was caused by a "common-envelope event." Image released Jan. 24, 2013. Scientists had long theorized that two stars can temporarily orbit each other with an envelope of gas they share. In these "common-envelope events," the star with less mass should become engulfed by matter from the larger companion star. The interactions between these stars can explosively hurl this super-hot envelope away from them at speeds of up to 2.2 million mph (3.6 million kph), releasing about as much mass as a supernova and about 10,000 times more than a nova. However, astronomers did not expect to see these events directly. They are both rarer than novas but not as bright as supernovas, making them difficult to spot. This image depicts a stellar outburst observed in the simulations of V1309 Sco, which scientists suspect was a binary "common-envelope event." After developing computer models of the properties of common-envelope events, researchers found the energies, colors, short time scales, ejection velocities of ILRTs, as well as the rates at which they happened, match those of the predicted properties of long-sought common-envelope events. "The surprise was that the appearance of the events (common-envelope events) is very different to what the original predictions were — the outbursts are much brighter and the durations are much longer than once thought," Ivanova said. This new model applies best to a subset of ILRTs often called luminous red novae. "It may be expected that not all of the ILRTs must necessarily be caused by common-envelope events, and some don't seem to be easily explained by our model unless it will be extended to take into account further complications," Ivanova said. Common-envelope events are thought to create many binary systems, and could potentially help produce the progenitors of type Ia supernovas and gamma-ray bursts, the most powerful explosions in the universe. The scientists estimate about 24 common-envelope events happen every 1,000 years per galaxy like the Milky Way. "We hope that the whole field of studies of interacting binaries — this includes such binaries as Type Ia progenitors, gamma-ray burst progenitors and merging double-stellar black holes — will receive a strong shake up," Ivanova said. Ivanova and her colleagues detailed their findings in the Jan. 25 issue of the journal Science.